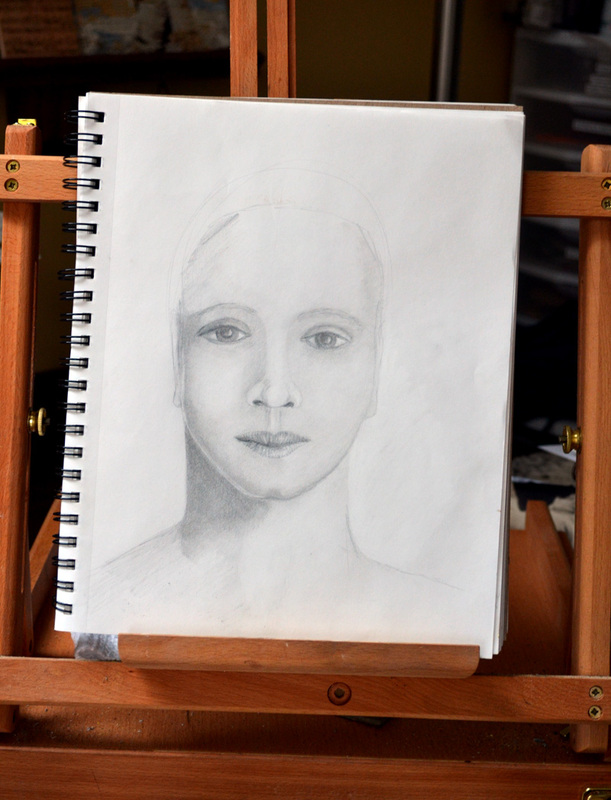 I am enjoying learning to draw in Misty Mawn's amazing class Face to Face. I have to learn to shade to show the shape. There is much work yet to be done on her. I have to tweak her nose over a bit I think, as her mouth is not quite lined up! That is what I am working on. And like many of my drawings, she has no hair! lol! I will be able to focus on hair. I have many drawings of bald ladies! lol! I must say...the art I see participants doing in Misty's class is totally awesome! Misty herself is just such a special soul! They all inspire me! 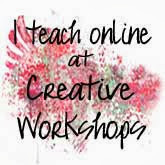 video taping my new class at Creative Workshops. 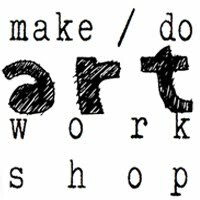 In this class we create jewelry for your soul! 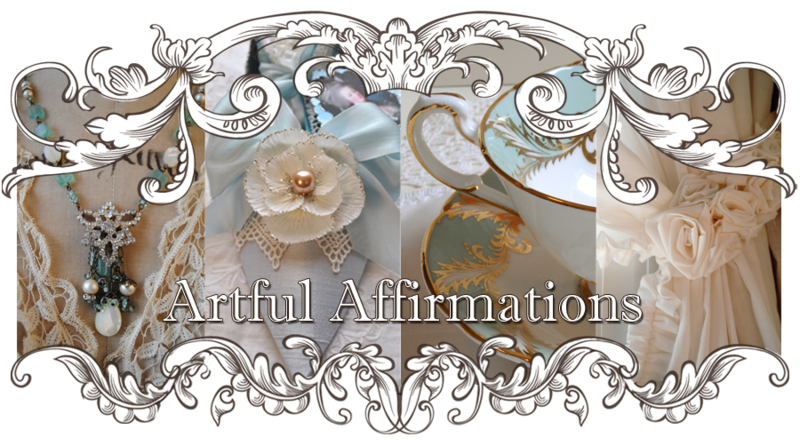 Artful, affirming, helpful, and inspirational! inexpensively with this simple soldering technique. 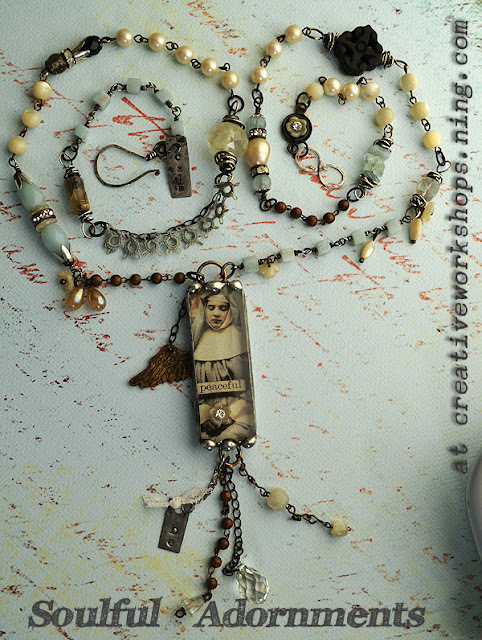 I chose a Mother Mary Image as this necklace is about nurturing. 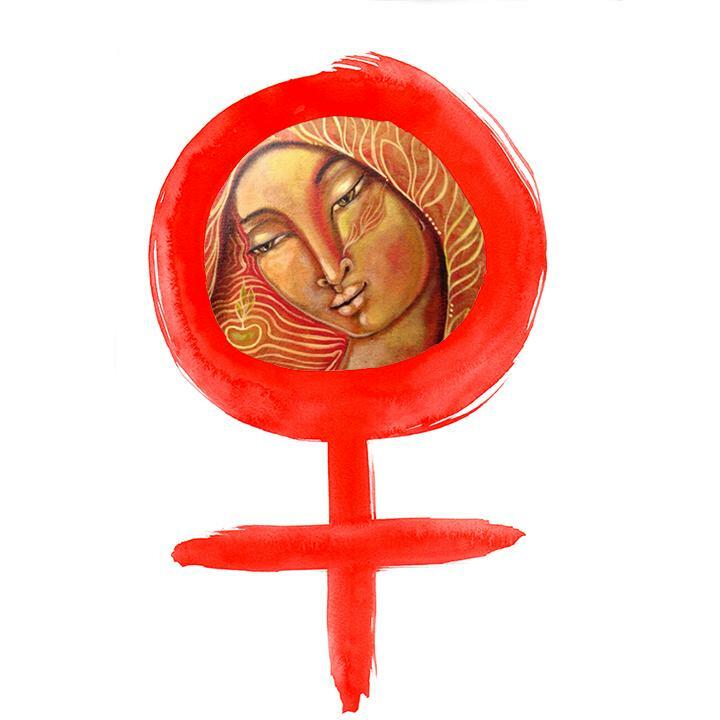 You can use your own artwork or any other images that speak to your theme and heart. with a completely different image and theme. Next post or two and I will share it with you as well. Terri you are so multi-talented! 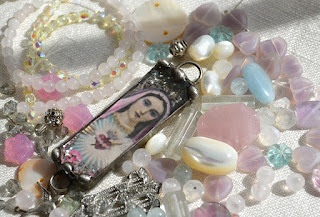 You know, you could always make Soulful Necklaces in the beading pattern on a true Rosary, too - one of the two prayers is the Hail Mary....so I believe it would be appropriate. Not sure, but would be awesome - it already kinda LOOKS like one, you know? I found myself admiring your art work. I find sketching such a difficult thing to do. As for your jewelry pieces, they are so beautiful and unique. 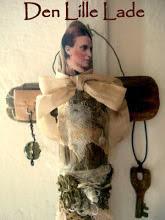 You should make a rosary. 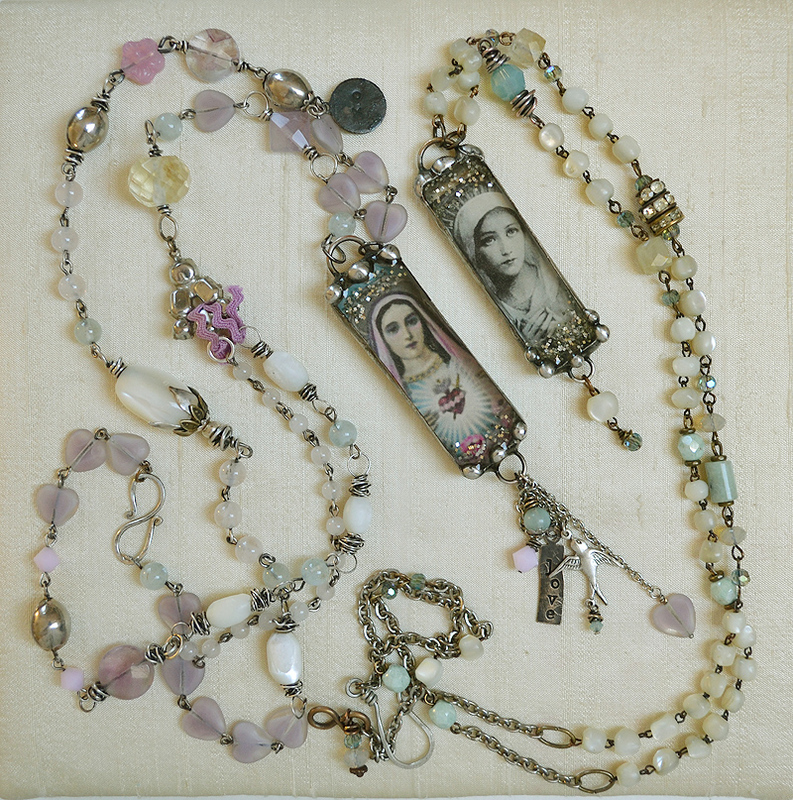 Those beads would make such a beautiful and unusual rosary along with an image of Mary like the one you have and a lovely Cross. Wow! I'm impressed with your drawings - hair or not! Your jewelry is lovely too. How talented you are! 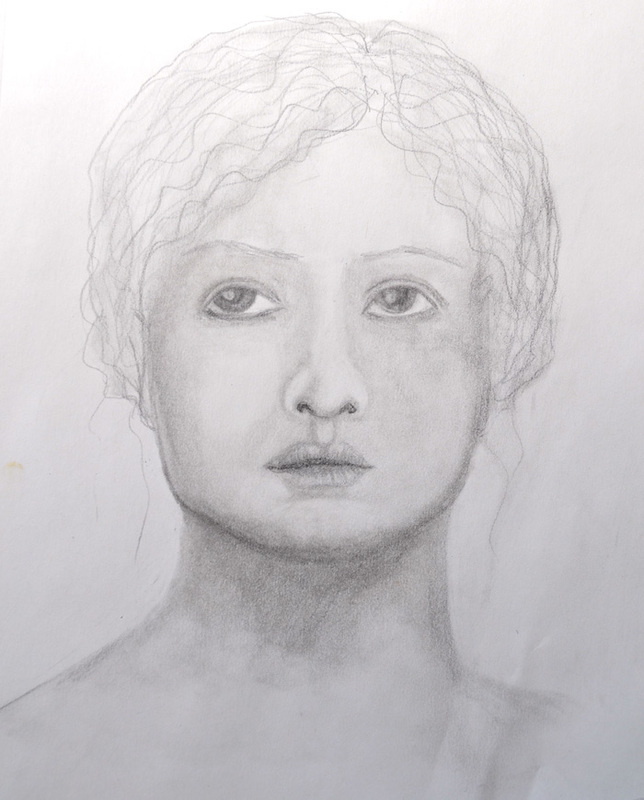 You are SO brave to draw faces....truly one of the hardest things to do! I SO admire your talents, Terri. It seems that you are capturing these faces beautifully...great shadows and highlights, too. Misty will be happy with your pieces ~ are you taking them to the class? Those necklaces are SO pretty! I wanted to take a class from Misty when she comes here in April that sounds pretty similar. Unfortunately it had already filled up, so maybe next time ;( You have a wonderful start! Belly fat is considered the most frequent illness at present. I agree, you would make lovely roasaries. I love the Pics you are using for the Blessed Mother. You are so very talented. Your faces are fantastic. I am so excited about your class, you are such a gentle and wonderful teacher! Everything you make you shows your passion, your gentleness, your compassion. Your necklaces are so gorgeous Terri, and your drawings are so beautiful, so real, they have so much character. You inspire me! Your face sketches are wonderful already Terri! 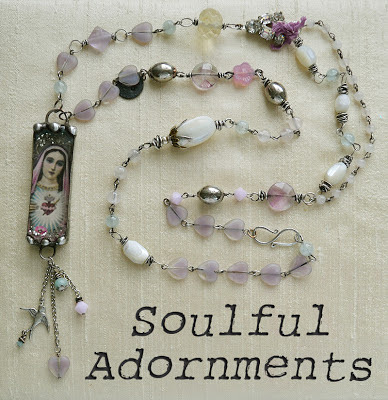 Love the idea of Soulful Necklaces-yours is gorgeous!! Terri, I am so excited about your new class. The thought of soldering intimidates the heck out of me, but also intrigues me. Can't wait to learn more about the class! Holly M.
You never cease to amaze me. Your drawings are beautiful and so are your soulful works of art. I am, as ever, inspired and overjoyed to see what you share with anyone who comes your way. Yay Terri!!! You are very talented! 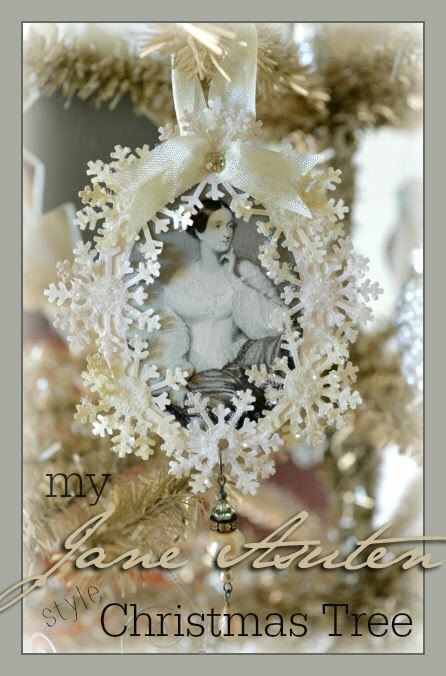 Love your sketch and the jewelry is wonderful too! What a nice outlet taking classes like that! Your drawings are wonderful and enjoyed seeing your work. You are so very talented and love the jewellery too. 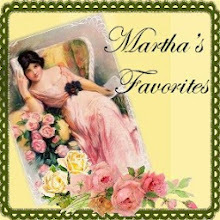 OMG this is specially wonderful...I follow all your tea cup collectoions it is so nice..
sur la tête de cette jolie dame ! Oh wowness Terri..your sketches are super gorgeous..your shading is sublime..stunning works..you are mega-talented! Beautiful!!! 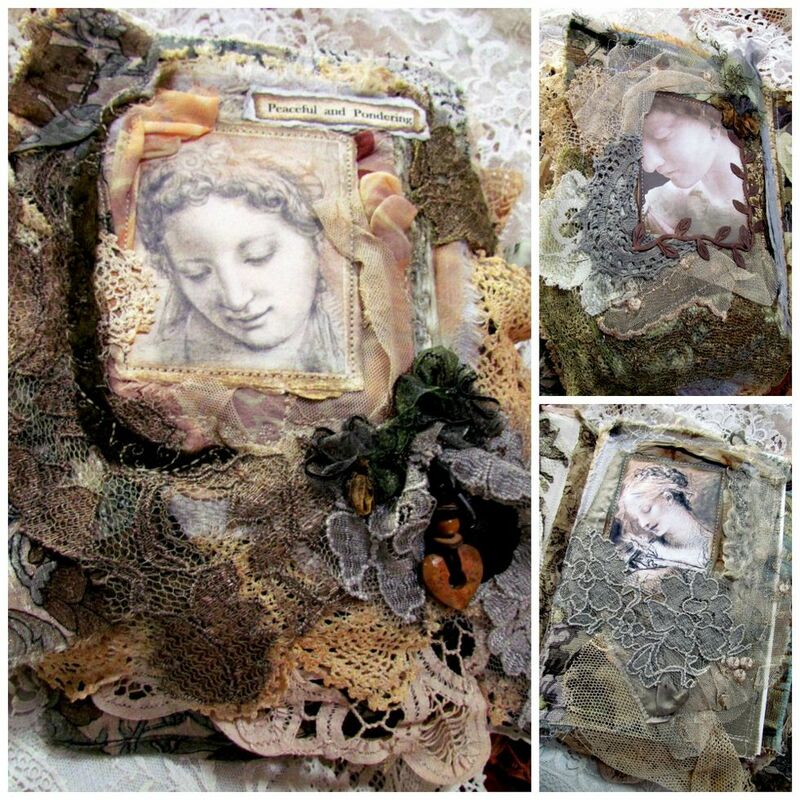 and Love your new course....congrats.. the Mary creations are divine and sacred and feels very special! yay! Shine on!! Thanks for such a magical post..your art is totally beautiful..powerful! Your necklaces are gorgeous,dear Terri and I'm really impressed with your drawings.You are such a talent.Have a wonderful week. Hi Terri, I`m home again after wonderful dayes with my daughter and her family,- trying to catch up, I found your beautiful drawings, how lovely your ladies are,-and the necklaces oh they are gorgeous dear Terri, it will be some wonderful classes. I had no idea you could draw, Terri....that just makes me love you all the more. Keep it up...and you'll get to the hair eventually...I d"hair" say it's one of my favourite things to draw on a face! your artwork is very good--you are doing do well in the class. I have always been drawn to faces and love to get lost in bringing out the life in them. your shadowing and highlighting are great!! Keep it up. 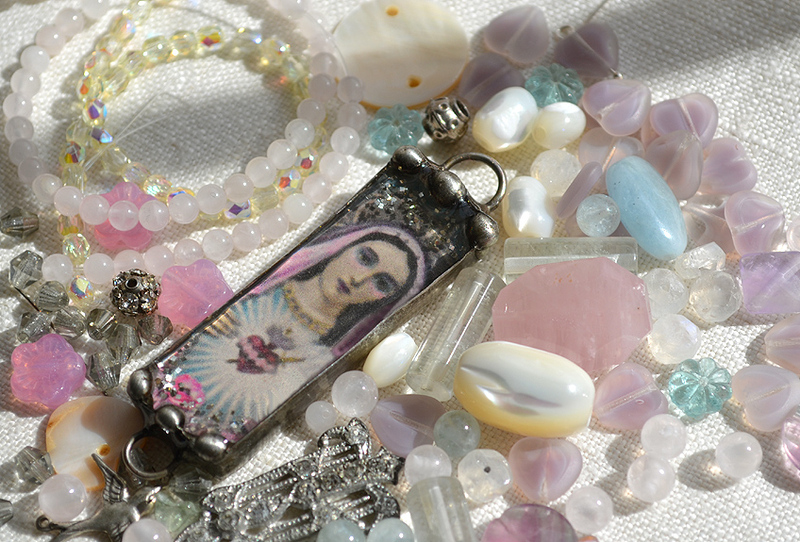 Oh the jewelry is so aptly named---being an old catholic girl--they really do speak to my soul.